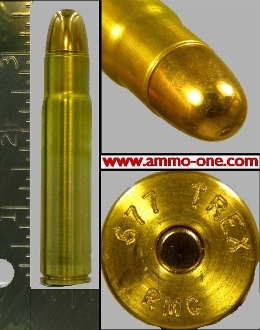 .577 Tyrannosaur 577 T-Rex ammo ammunition for sale single cartridge. Please Note: This is “LIVE” ammunition. One Cartridge: 577 Tyrannosaur custom loaded by a licenced ammunition maker for ammo-one.com, loaded with new turned brass with a “577 TREX” Head-Stamp and a 750 grain, FMJ (Full Metal Jacket) projectile. Other .577 Tyrannosaur available, see below in related items. The 577 Tyrannosaur , a.k.a. 577 T-Rex was the largest Proprietary Cartridge introduced in 1993 by the now closed A-Square Company as an entirely brand new Cartridge for the A-Squire rifle.